The challenges facing today's sales executives and their organizations continue to grow, but so do the expectations that they will find ways to overcome them and drive consistent sales growth. There are no simple solutions to this situation, but in this thoroughly updated Second Edition of Sales Growth, experts from McKinsey & Company build on their practical blueprint for achieving this goal and explore what world-class sales executives are doing right now to find growth and capture it—as well as how they are creating the capabilities to keep growing in the future. 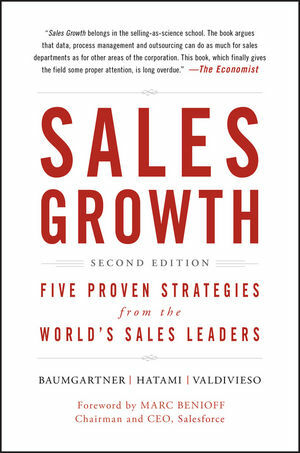 Based on discussions with more than 200 of today's most successful global sales leaders from a wide array of organizations and industries, Sales Growth puts the experiences of these professionals in perspective and offers real-life examples of how they've overcome the challenges encountered in the quest for growth. The book, broken down into five overarching strategies for successful sales growth, shares valuable lessons on everything from how to beat the competition by looking forward, to turning deep insights into simple messages for the front line. Page by page, you'll learn how sales executives are digging deeper than ever to find untapped growth, maximizing emerging markets opportunities, and powering growth through digital sales. You'll also discover what it takes to find big growth in big data, develop the right "sales DNA" in your organization, and improve channel performance. Three new chapters look at why presales deserve more attention, how to get the most out of marketing, and how technology and outsourcing could entirely reshape the sales function. Twenty new standalone interviews have been added to those from the first edition, so there are now in-depth insights from sales leaders at Adidas, Alcoa, Allianz, American Express, BMW, Cargill, Caterpillar, Cisco, Coca-Cola Enterprises, Deutsche Bank, EMC, Essent, Google, Grainger, Hewlett Packard Enterprise, Intesa Sanpaolo, Itaú Unibanco, Lattice Engines, Mars, Merck, Nissan, P&G, Pioneer Hi-Bred, Salesforce, Samsung, Schneider Electric, Siemens, SWIFT, UPS, VimpelCom, Vodafone, and Würth. Their stories, as well as numerous case studies, touch on some of the most essential elements of sales, from adapting channels to meet changing customer needs to optimizing sales operations and technology, developing sales talent and capabilities, and effectively leading the way to sales growth. Engaging and informative, this timely book details proven approaches to tangible top-line growth and an improved bottom line. Created specifically for sales executives, it will put you in a better position to drive sales growth in today's competitive market. THOMAS BAUMGARTNER is a senior partner in McKinsey & Company's Vienna office. He co-leads McKinsey's work on sales and channels globally. Thomas advises clients in industries including high-tech, electronics, transportation, basic materials, telecommunications, and consumer goodswhere he helps them outline and drive large-scale, top-line growth programs. HOMAYOUN HATAMI is a senior partner in the Paris office of McKinsey & Company. He leads the firm's Marketing & Sales Practice in Europe, the Middle East, and Africa. Homayoun has a broad range of experience working with clients around the world to help them drive above-market growth. MARIA VALDIVIESO is a director of knowledge in McKinsey & Company's Marketing & Sales Practice, based in Miami. She advises B2B and consumer companies on driving sales growth and commercial transformations, and leads McKinsey's research on sales and channel excellence. The best sales leaders drive growth for their companies. They use data and insights to anticipate market momentum and pinpoint where untapped potential lies. They steal the march on competitors and lock in new customers first. Insights from economic, technological, and behavioral megatrends translate into opportunities at the front line. The best sales leaders invest ahead of emerging demand and cultivate demand for products that won’t be available for many months. Peering into the future and harnessing tomorrow’s trends is a job for sales leaders, not just visionary CEOs. Averages are misleading. Take a microscope to existing markets and see the opportunities that competitors routinely overlook. Drill down below the zip code level or look at customer segments by industry or demographic characteristics to reveal untapped pockets of growth. Then turn the analysis into a simple message for the front line. Big data opens up amazing sales opportunities. There are already B2C and B2B companies translating data into operating margin improvements of up to 25 percent. Players in all sectors can follow suit if they build insights from a wide array of internal and external data sources and create tailored selling propositions based on personalization. But to maximize the benefits of big data, it needs to be at the very heart of the sales culture. Sophisticated customers are not interested in traditional sales models. They demand faster, more seamless, and even enjoyable sales experiences; they want more information and more value, and they want it across all channels. Delivering all this is hard enough—doing so profi tably in both mature and emerging markets is a major challenge. Leading sales organizations are finding ways to improve digital, direct, and indirect channel performance, and are cracking the code of how to integrate them. No company can compete today using only a single sales channel. But with so many channels to manage, how can you ensure consistency, maintain close contact with customers, and raise profitability? The best sales leaders blend remote and field sales, integrate online and offline channels, orchestrate direct and indirect sales teams, and even use service as a sales channel. Can your company really claim to be cutting-edge with its digital strategy? The most forward-thinking organizations see sales figures and conversion rates skyrocket when they get digital platforms right. They test and tweak constantly to delight the customer and turn clicks into sales. They embrace mobile and understand the benefits of building customer relationships across platforms. Finally, they recognize that digital cannot stand alone—it is seamless integration with other channels that wins the day. When did you last change your direct sales approach? Leaders of the most successful direct sales forces have done just that. They now engage customers early—often before any sales pitch—which can help unlock growth in key accounts and is the prerequisite for solution sales. Even for the biggest suppliers in the most highly developed markets, there are always new ways for hunters to land new customers. Often a partner is the best or only way to reach the fastestgrowing markets, but the partner relationship can be fraught. The winning approach is simple: treat partners as an extension of the sales force, help them with their bottom lines, and set clear guidelines for channel confl ict. Companies that master the challenge improve channel revenues by 10 to 20 percent and cut cost of sales by 5 to 10 percent. Fast-growing emerging economies present huge sales opportunities, but successful sales organizations don’t blindly rush in. They balance the need for speed with a nuanced understanding of the specific local market; to spare a lot of grief later, they overinvest in finding the right partners; and they think big—building up sales capacity well in advance of needing it. Sales leaders can’t deliver growth or optimize channels by waving a magic wand. No frontline effort can succeed without the right back-office capabilities and presales support, and the very best companies extract the full value of marketing. An efficient and effective sales-support operation backed by the latest technology is critically important for supporting both the direct sales force and channel partners. Sales operations not only represent a huge opportunity for cost improvement—reducing back-offi ce costs by 20 to 30 percent is not unusual—they are also an important contributor to customer experience, and sales force and channel effectiveness. An effective back office can boost revenues by 10 to 25 percent by giving frontline sales teams 50 percent more time to sell. Customers, meanwhile, love the smoother fulfillment and faster turnaround time. Choosing the right leads to pursue is vital for profitable sales growth, especially in light of buying teams’ growing sophistication. A high-class presales team will both qualify the leads, identifying the most profitable and most winnable, and use their expertise to put together compelling pitches for them. Despite its impact, presales is often underresourced, but the right people working on the right deals will deliver impressive results. Despite their interconnections, it can seem like marketing and sales are speaking different languages. Successful sales leaders work with marketing, benefiting from the segmentation skills it brings and feeding back insights from the front line to refine the next campaign. Ultimately, the two can combine forces to drive repurchase and loyalty, the most profitable sales growth of all. Sales technology continues to evolve, but companies must ensure that it enables success instead of gathering dust in a metaphorical backroom. Technology helps sales leaders pull ahead of their peers, arming account managers with killer insights or improving better integration with channel partners. It requires investment, but the top companies understand the benefits, and they focus on acquiring the right analytical tools and talent so that technology delivers the high returns it promises. Sales leaders can have all the market analysis, all the multichannel processes, and all the technological wizardry available, but without investing substantially in the right talent, they will achieve little. Performance management is the bedrock of many sales organizations, especially as performance varies more in sales than in other functions. The best management invests enormous energy in this field and can see close rates rocket by 25 percent, higher customer satisfaction ratings, and up to 30 percent higher contract values. To achieve this, they coach rookies into stars, set the right tempo for reporting and intervention, and know that motivation goes deeper than money. Achieving excellence in sales for six months is great; embedding it in the genes of the organization is better. World-class companies create a culture fit for the long term. They give middle managers a starring role as agents of change, and they focus on creating crack teams, going beyond individuals’ skills to build institutional capabilities. It’s time to think about accelerating sales growth in your own company. Sales leaders need ambition, determination, and the persuasive skills to bring both the board and the front line with them on what can be a challenging, but extremely rewarding journey. Sales leaders know they themselves must be at the vanguard of change. Without strong leadership, any growth program will founder. Best-practice leaders challenge the status quo, they galvanize their team, they model change, and they demand results above and beyond everything else. The preceding chapters are rich with ideas, examples, case studies, and interviews with leading sales practitioners. Now it’s over to you. For sales leaders determined to drive change and seek the sales growth on offer, we have a self-assessment guide and some benchmarks to get you started. Stakeholder alignment is essential, as is a clear vision of how to prioritize the transformation effort. Only 30 percent of change programs succeed—ensure yours is one of those that make the grade. It is brave (or foolish) to predict the future. Nevertheless, we offer our views on the trajectory of sales management. The rise of automation brings enormous opportunities for value creation and sales growth, but is not without its challenges. Companies should already be preparing for a major overhaul of how they sell—no industry is immune. The greatest benefit may come from not selling at all and outsourcing the function to a third-party specialist; less the “death of the salesman” and more the death of the internal sales function?